112. Human Resources Management: Surviving During Changes In Management (1/2) – How to Shape Human Behavior. 00:00:27 Branding strategy changes, moving from a function-oriented business model to product-oriented business model, re-structuring, re-engineering, mergers and acquisitions, cultural changes, payscale and bonus changes, down-sizing, right-sizing, change in leadership cultures… All of these are examples that require significant change management. Change management is “an approach to transitioning individuals, teams, and organizations to a desired future state.” The changes are specific, significant, strategic changes made to the company of which many, if not all of the employees are impacted. Be it as a victim or as a leader, but this is something that everyone will experience at least once over the course of their career. People like change, but they don’t like to be changed. Change requires modifying existing behavioral patterns, processes, procedures and attitudes. As a result change always comes disfunctional resistance. Companies don’t want employees who are resistant to change. [EDITOR’S NOTE: Recall in the lecture Human Resources Management: How To Keep Quality Employees (½) that high-performing employees tend to leave companies because they have more options available to them, are likely to be more mobile and flexible, well-networked,etc. 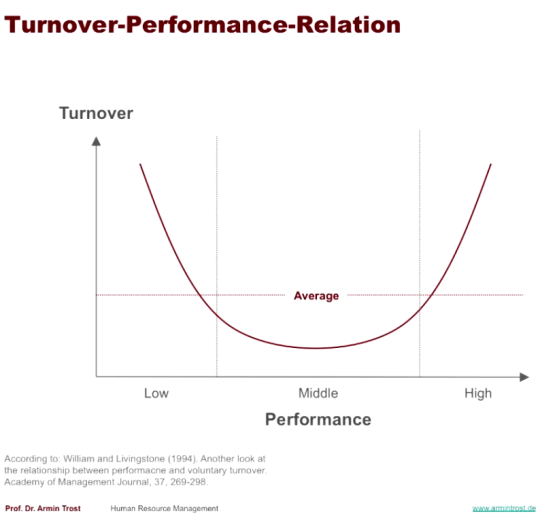 and that low-performing employees tend to leave companies because they can’t adapt and fit in with the company culture, which results in a limited loyalty to the company, and low-performs usually have conflicts with their peers, as it is their peers who must constantly do that person’s work. Once that person has been branded as a loser, they prefer to change companies than try to overcome their ‘reputation,’ etc. 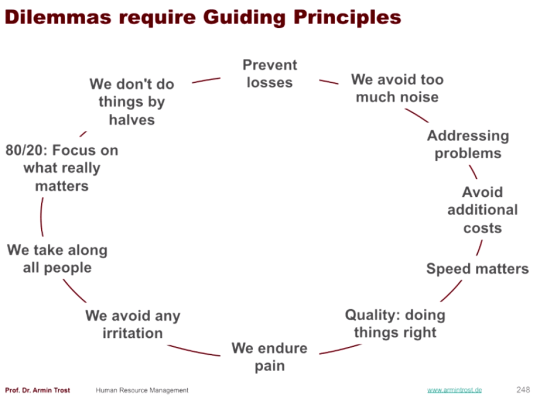 The middle stages (immobilization, denial, anger, bargaining, and depression) in the chart above are dysfunctional and can really lead to problems for your company. 00:27:43 Learned helplessness is “a perceived absence of control over the outcome of a situation,” and a behavior in which a human is forced to endure painful or unpleasant circumstances, and yet unwilling to take actions to avoid or overcome the unpleasant circumstances, even if it is in their power to do so. Depression is a common consequence of severe learned helplessness. 00:33:03 You need to plan ahead and address this resistance. Change is seen as subjective. People worry about change and you have to take their concern seriously, even if their worry is unfounded. Accept their reality and address it, and they will take you seriously and be more open to listening to and reasoning with you. 00:40:22 Formal leaders are those who, on paper, are granted by the company the authority to persuade. Thought leaders, or opinion leaders, are the naturally persuasive people who other people look up to and consider their opinion to be important, both for good and for bad. When it comes to handling resistance, managing the discourse of the opinion leaders plays a significant role in change management. 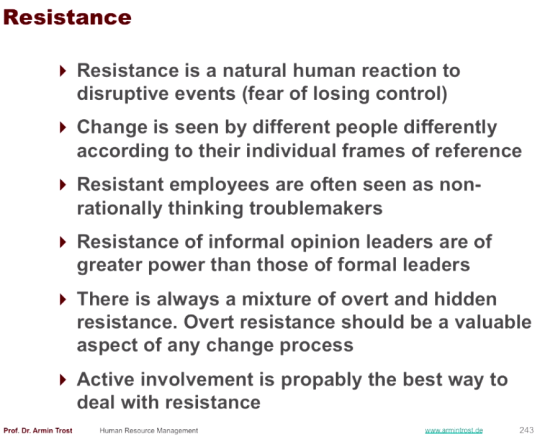 Active involvement is probably the best way of dealing with resistance. Involve all parties in the discussion and decision making process, even if the decision still stands, and the people are much more likely to go along with it. [EDITOR’S NOTE: For more about involving people in the decision making process, even if they won’t be officially involved, read the book 27 Powers Of Persuasion by Chris St. Hilaire. 00:46:21 Just as there are predicable responses for change beyond the control of the individual, there is a preditable response for change made within the control of the individual. Informed Optimism – You are now able to predict, and even taste the end of the project. Completion – You successfully accomplish the project you set out to do. A good book to read is Managing At The Speed Of Change by Daryl Conner. Reaching, or being able to create, a level of urgency is a key trigger in change. Until people feel that the change is absolutely necessary, they have no reason to get behind it. 01:00:12 Along with creating a sense of urgency you need to have a well-defined vision to communicate. 01:05:52 The first step in the change management framework is initialization: The birth and development of an idea to improve the company. The initialization phase ends when the person in power makes a final ‘yes/no’ decision. If yes, then the scope, objectives & vision are established. Then the setup, principles and budget are outlined and the appropriate team is brought together. 01:10:21 Guiding principles ensure that the project runs smoothly, efficiently and on budget. It’s imperative to choose at least one principle right at the beginning of the change process and keep it as your most important metric. For example, focusing on speed, knowing that quality may suffer. Advertising agences do their best to provide all three, and there are those few magical creative ideas that accomplish all three, but more often than not brands have to choose between two of them rather than having all three of those options. 01:16:32 Chance can be instanteous – Starting January 1st, all employees must use the new software system – or gradual – Over the next four months, each deparment will make the software switch. Of course, no change is without it’s setbacks and chaos. This requires a stabilization phase so people can get accustomed to the change and work through any bugs. Posted on June 2, 2015 January 17, 2017 by Joshua SMITHPosted in videosTagged Armin Trost, change management, hochschule, human resources, startups, videos.